Multiplayer 1v1 map, good (archons) vs evil (undead). I tried to keep it balenced, it really all comes down to a magic-struggle, due to the small map and the potential domain radii. Story- The province of Kelande has been cursed and has been perverted in to a realm of living dead. A great hero of the past, an elf named Pheare Dukal, has arisen again as their ghoulish leader. 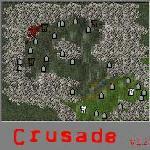 Now Lord Nelfod leads a crusade of holy warriors to reclaim the land and put Pheare Dukal back to his rest. Good for a quick game, one on one. I can see that the author is trying to make up for the weakness of the undead forces. However it might have been slightly overtilted to the undead, if humans are playing the game. No real story, just two forces going head to head. As said, a good map for a quick fight between two players of almost equal caliber. There is a likely chance that an expert player would be able to exploit the Undead 'handicap' created in this map. The archons are stronger than the undead and easier to play as. The default squire setting is too easy, I suggest you raise the AI:s strength some. Not ugly perhaps, but very simple and a bit undetailed. There's a small story in the beginning and the wizards descriptions are edited. The highlight of this map. 8 custom heroes with cool names and the two wizards are custom. I guess mass producing titans is some fun, but only for a while.